Calling All Deer! - the4pointer.com | Real Hunts. Unreal Stories. In a previous post I mentioned that when I was a just a young(er) fella hunting with my Dad we discovered the power of a using a grunt call. That experience resulted in a nice buck for my memory vault and a lesson I’ll never forget. Since that time I have been enamored with calling, and as the years have gone by I have continued to study and experiment with calling. I’ve even learned a few more things along the way. This is not intended to be a comprehensive manual for calling deer. There are many factors that I do not even discuss such as time of year, rut phase, buck to doe ratios, etc.. Learning how to call deer is kind of like learning how to perfect your golf swing and it could not possibly be covered in one post. However, there are a few basics that will increase your odds of success and I’ve decided to write about five tips that will help you improve your calling techniques. Before you read my five incredible tips I need to state that I consider any deer coming into a call a success, not just killing a deer that comes in to a call. 1. The set up is crucial to success. To date, I took my biggest deer as a result of calling. 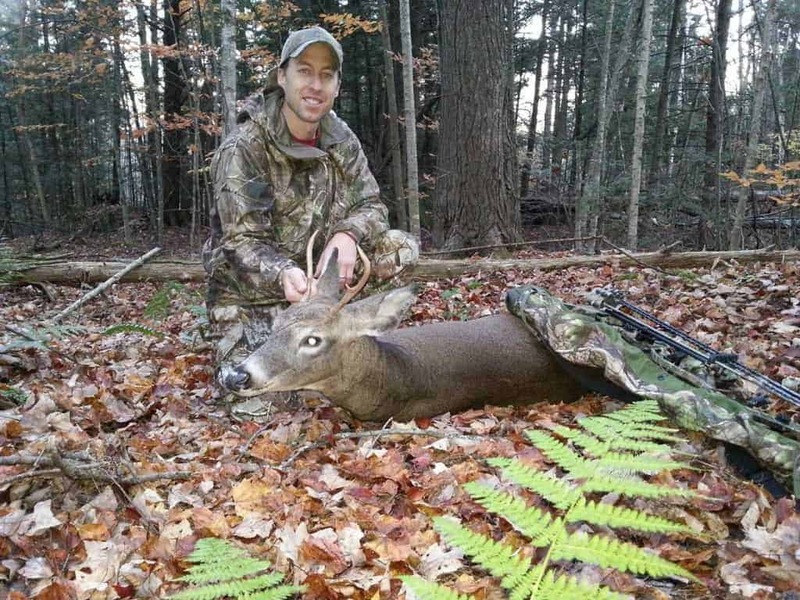 It was opening morning of rifle season in Vermont and I was sitting in a tree stand that was positioned in the middle of deer travel routes as they walk horizontal along a big ridge. Also unique to the set up is that the stand is located about 100 yards off of a field and at the base of a ridge which is often used as a bedding area. Around 7:15 I heard some noise up on the ridge and decided to blow a few grunts. A few minutes later I heard a deer walking and looked up to see a buck walking straight towards me from down of the ridge. He stopped about 50 yards away. I shot and he dropped straight to the ground. Then he got up…he ran straight towards me and that’s when I saw how big his rack really was. I shot him two more times in the chest and he finally went down for good. If I am totally honest (what hunter isn’t :)?) I hadn’t been to that stand for three weeks so it’s not as if I scouted for days on end and picked the perfect spot based on my findings. However, in my defense, I knew the area well and had seen many deer there before. I was also aware of the available feed, bedding areas, and travel patterns. But, after all the commotion and celebrating was over I did some further scouting and I determined why I believe that buck responded to the grunt call that morning. First, and most importantly, there were some fresh scrapes in the field. Second, the wind was lightly blowing up hill. So, I deduced that he had been walking the side of the hill taking advantage of the wind to check his scrapes for fresh scent. When he heard me grunt he assumed another buck was near his scrapes and had to come in for a closer look. Pay attention to why a buck chooses a particular location for his scrapes and choose your set up based on how you think he is using the lay of the land to check them. 2. Be willing to try new things, it’s crucial to success. Since opportunities to watch buck behavior are few and far between I end up experimenting calling techniques on does. One night I was hunting over some apple trees and a doe stepped out about 80 yards away right at dusk. I had no intentions of shooting her so I just decided to use my Primos Can Call to see how she reacted. She ended up coming to within 20 yards. When she couldn’t see what was making the noise she got nervous and left. What I learned was that does will come in to a Doe in Estrus noise. Deer are curious so if they here a noise and can’t see what’s making it they will come check it out. The moral of the story? Don’t be scared to try new things. 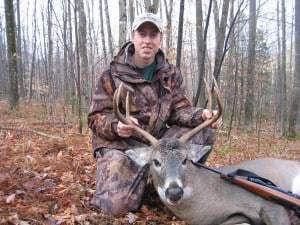 A couple of years ago I discovered a nice fresh scrape line during muzzleloader season in Vermont. It was down to the last weekend of the season and I had one more chance to hunt it. The scrape was located halfway up a big hill and the only way to approach it was from above since the deer fed below it at night. My plan was to climb a couple hundred feet in elevation on the opposite side of the ridge before dawn and work my way around to the side of the ridge with the scrape line and wait until light before moving in any closer. The timber was so thick that I thought the best thing to do would be to use a combination of grunts and can calls every ten minutes. If nothing showed than I would move forward another 50-60 yards and repeat. When the timber is thick I always like to try and bring the deer to me instead of exposing myself trying to get to them. I should say that the wind had been perfect during the entire climb. Right in my face, just the way I like it. But as I worked my way around the hill it shifted and was slowly wafting down the hill – right towards the scrape line. I pressed on, too far into my hunt to want to change anything. I had reached the beginning of the scrape line but was still high above in elevation. The woods changed to a mature stand of hemlocks which provided some long distance views of almost a hundred yards. I continued my calling sequence but I dropped in elevation until I was roughly 80 yards above the scrapes which put them just on the edge of my visual range. I decided to sit there for a while so I unpacked my gear and blew the grunt call again. Then I poured myself a cup of coffee… CRASH! CRASH! CRASH! A nice buck came charging up the hill and paused below me. By the time I set my coffee down and picked up my gun all I saw was his rack (a nice, thick heavy one I might add) running through the brush away from me. I was so mad at myself. I knew that if a buck was going to respond to a call in this particular situation he would have come in downwind yet I had let my guard down. If I had been at the ready I might have gotten a shot off before he smelled me and trotted away. I felt good knowing that my plan had worked just as I thought, but the coffee didn’t taste near as good after he ran out of sight. 4. Study deer that are not affected by humans, it’s crucial to success. What do I mean you ask? Well, I believe that those of us who hunt in New England are at a disadvantage when trying to learn the ways of the whitetail in a couple of ways. First, in urban environments the deer do not react the same to calls as deer that are unaffected by humans on a daily basis. For instance, deer that live around houses and are constantly pushed around by hikers, mountain bikers, and obscene amounts of hunters do not react the same to calls as those that are not. So, they are probably not going to respond to a call like a deer that is further off the beaten path where deer are allowed to be themselves. Second, because the area is so wooded, hunters do not get the chance to study how deer react to calling because it’s not very often that you have an opportunity to watch deer over long lengths of time. This is likely the biggest disadvantage because so much of learning comes from experience. My solution? 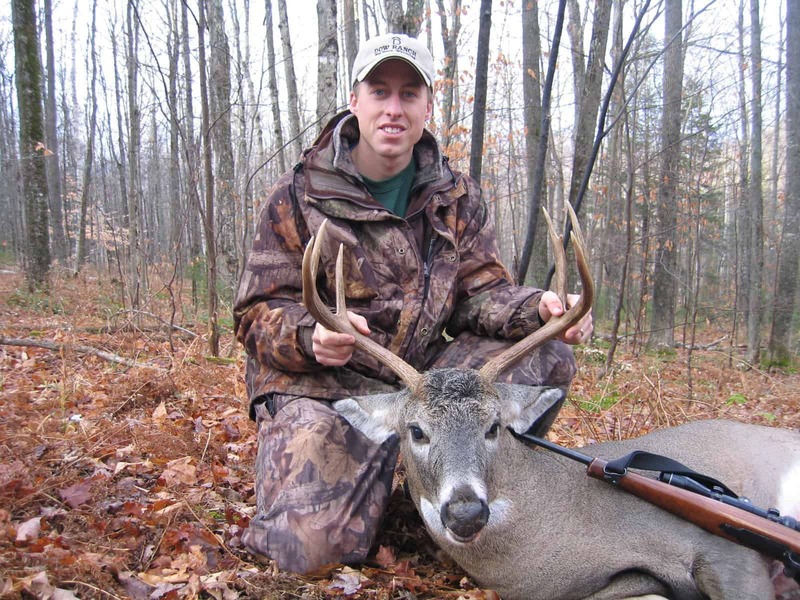 Watch hunting shows that showcase hunters calling to deer. That may sound goofy, but I have learned an awful lot about how deer react to calls by watching shows and I have applied the same techniques when I am out in the woods. You can really help your chances by studying ahead of time and I have seen the results. I’ve learned the most from the guys at Primos. They are very good at explaining calling techniques. 5. Don’t forget your calls at home. If your desire is to call, and you don’t have them, you will have no success. It’s definitely crucial. One time I arrived at my hunting location only to discover I had left my bow at home. It was very embarrassing but at least I was alone. The moral of that story is that you can’t shoot a deer if you don’t have anything to shoot it with. Likewise, if you don’t have your calls you can’t call one in. Need I say more? In summary, I don’t think I am suggesting anything other than what a hunter should do anyway – Scout, try new things, pay attention, watch hunting videos, and don’t forget your gear. That’s not so hard is it? Having an animal respond to a call is one of the most exciting experiences one can have in the woods. To think that you or I can be skilled enough to fool a wild animal into responding to a sound is pretty cool and is well worth the effort to learn how. Awesome post. I was going to ask you about this. What’s your opinion on frequency of cold calling? I usually try a variation of bleats and grunts every 20 to 30 minutes, mostly bleats earlier in the fall. Basically I just don’t want to “over call”.